Please come vote on April 25 for the 2018-19 Reopener IP. Voting will be at the LampPost Pizza near the corner of Yorba Linda Blvd and Richfield (17568 Yorba Linda Blvd ). Voting will occur between 11a and 3p. The Initial Contract Reopener Proposal will be available for review. This is for your review before we post the date of the vote. Click here for PDF. Add a section to ensure that bargaining unit members in all classifications are provided paid training related to student, employee, and campus safety. Modify to include specifications of workings hours for custodial coverage for Saturday School sessions. Add a section to ensure that the assignment of extra work is offered to bargaining unit members prior to substitutes or short-term employees. Modify to include a fair and equitable salary schedule increase. Maintain fair and equitable medical benefits. Modify to add one (1) additional holiday. 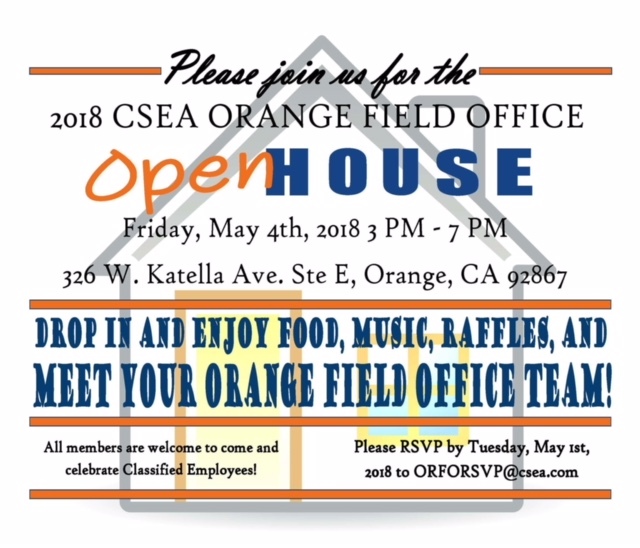 CSEA and its Placentia-Yorba Linda Chapter 293 reserves the right to add, delete or modify these proposals as determined through the bargaining process, including but not limited to responses to proposals made by the District. Please see the attached notice regarding information meetings for the new insurance plans. Note that these meetings begin Monday April 9. These meetings are information only; you cannot enroll in the new plans until the open enrollment period. This will occur during the dates of April 23 – May 25. If you have any questions, please call Risk Management at 985-8476 . You are currently browsing the Placentia Yorba Linda California School Employees Association blog archives for April, 2018.